Janardan Resort in Churaini is one of the reputed resort from the chain of Janardan Resort in Churaini village near Pangot, Nainital that is famous for tented accomodation in exotic and lush green site locations offering a once in lifetime opportunity to live with nature as real it gets. What makes this experience unique and one of a kind is that a great deal of consideration and effort has gone into providing guests such services that a normal camp expedition would not be able to provide. The resort is located at Churaini village in Pangot, a small town in district Nainital in Kumaon region of Uttarakhand. From Pangot it is a 3.5 Km trek to the camp site at Churaini Village. Churaini is 19 Km away from Nainital. Nearby tourist attractions are Cheena Peak Range via Snow View Point (15 Kms) and Kilbury (24 Kms), which are famous spots among bird watchers as migratory birds and rarest of the species plays guests and hosts to this place. The resort provides 8 tents accomodations for adventure and nature lovers from all over the world amidst of the calm and peaceful terrain that still remain untouched of the civilisation. 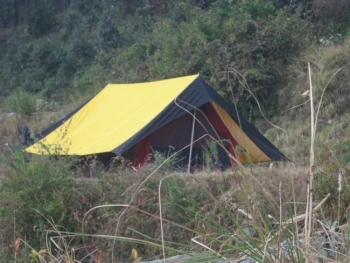 The accomodation are provided in all weather Tents and Camps to willing guests. A separate dinning place is organised in keeping with the theme Janardan Resort Camps.On demand multiple mouth watering dishes are prepared by dedicated kitchen staff at the behest of guests. - Fully furnished, spacious, fully furnished 10x10 double bedded swiss tent, attached bathroomwith, western style toilets with wash basins and mirrors are provided, all tents have furniture, carpeting and solar lightings. - Seperate dining facility, dedicated staff, etc. Churaini is a 3.5 Km trek from Pangot which is well connected by motorable road to Delhi (322 Kms), Dehradun (310 Kms), Haldwani (48 Kms), Nainital (15 Kms) and other major towns of the state and region. Private & Roadway buses, Taxies are available from major towns of Kumaon region. Nearest airport is at Pantnagar which is 72 Kms from Churaini. From here, either board a taxi or bus for Churaini via Pangot or Nainital. Nearest railway station is at Kathgodam which is 40 Kms from Churaini via Pangot.